Russell Wilson could best be described as a mechanical quarterback. The consistency in his drop step alongside his move within the pocket and evade when the pocket collapses is one you would find in just a few players in his position. When it comes to accuracy in passing the ball, Wilson is a stellar quarterback. The strength of his arms gives him an edge over others when it comes to delivering the ball without hitches. Apart from making deep throws and touches that put the ball on a receiver in stride, he is very effective in ball scrambling. Without a doubt, he is a skillful and classic play extender with outstanding football intelligence. The American football quarterback was born on November 29, 1988, as Russell Carrington Wilson. Cincinnati, Ohio, is his birthplace but he grew up with his family in Richmond, Virginia. He had his high school education at Collegiate School which is also located in Richmond, Virginia. While studying, young Wilson also began his football career, making 3,287 yards throws, and 40 touchdowns in his junior year. He also recorded 634 rushing yards and 15 touchdowns, earning himself the Richmond Times-Dispatch Player of the Year twice. Aside from football, Wison also thrived in other sports like baseball and basketball. Leaving high school in 2006, Russell Wilson was offered a football scholarship by two prestigious universities – Duke University and North Carolina State University. On July 23, 2006, he decided to settle with the latter. The young player redshirted in the 2007 season but played in 2008, finishing with 150 of 275 attempts for 1,955 yards, 17 touchdowns, and one interception. He was largely recognized as the first freshman quarterback to earn All-ACC first team honors. However, he left the University for the University of Wisconsin after his ordeal with his coach at NC. At Wisconsin, Wilson enjoyed the rest of his college football career, winning the Griese-Brees Big Ten Quarterback of the Year award and making the All-Big Ten first team. After completing his college football career at the 2012 Senior Bowl, Russell Wilson automatically got himself a place in the NFL draft. He was selected by the Seattle Seahawks as the 75th overall pick. Wilson, as of 2018, still plays for the Seahawks. As a member of the offensive team, Wilson continues to earn for himself good awards and titles as he improves on his athletic performances. He has been named to the Pro Bowl six times, was the NFL Rookie of the Year for 2012, and the NFL passer rating leader. Also, Wilson is the Pro Bowl Offensive MVP for 2015 and the NFL passing touchdowns leader. He broke several Seahawks single-season passing records and was the franchise first quarterback to record over 4,000 yards in one season. Giving his output on the field, the Seattle Seahawks seems not to be ready to let go of the young quarterback. As its offensive captain for five consecutive seasons, the Seahawks rewarded Wilson with a four-year contract extension worth $87.6 million, including a $31 million signing bonus. This puts his salary at $31.8 million including the bonus. Russell Wilson also earns $10 million from endorsement deals with companies like Bose, Nike, Microsoft, United Way, Wilson Sporting Goods, Eat the Ball, Facebook Live, Alaska Airlines, Luvo, Braun, and The Players Tribune. This puts his net worth at $41.8 million, as estimated by Forbes in 2018. Born to Tammy Wilson and Harrison Benjamin Wilson III as the second of three children, Wison has an older brother named Harrison IV and a younger sister named Anna. His father is a lawyer while his mother is a legal nurse consultant. Wilson’s father played both football and baseball at Dartmouth and he was an NFL prospect. The QB is of Native American and African-American heritage. He is married twice, his first was to Ashton Meem, his high schoolmate. While Wilson attended North Carolina State University and then the University of Wisconsin, Meem went to the University of Georgia but they still maintained their love life and got married in January 2012. They remained together until they filed for divorce in 2014. It was revealed that Wilson and Meem separated because of her alleged affair with Golden Tate, Wilson’s teammate. 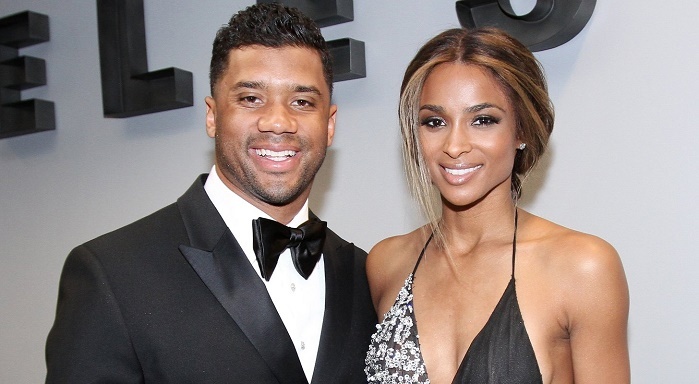 On July 6, 2016, Russell Wilson got married to his new wife Ciara Princess Harris, a Texas-born. The couple welcomed their first child Sienna Princess Wilson on April 28, 2017. The two are still together enjoying their relationship. Russell Wilson is 5 feet 11 inches tall and weighs 93 kg. When he joined the NFL Draft in 2012, it was reported that he’s 5ft 10 5⁄8 in (1.79 m). His weight at that time was 203 lb (92 kg) with an arm length of 31 inches (0.79 m) and hand size of 10 1⁄4 inch (0.26 m).